Burgundy is a region in eastern France known for the best vineyard and wine making. Many varieties of grapes orientated from here, and some wines are produced only in Burgundy. Red and white wine are equally represented here. Chardonnay is main grape variety used for the white wine, and for the red is Pinot noir. Red and white wine are also made using others varieties of grapes, like Gamay and Aligoté. Some sorts of Rosé and Champagne are also produced here. Winemaking in Burgundy dates back to medieval times when monasteries had a crucial part in developing wine production. 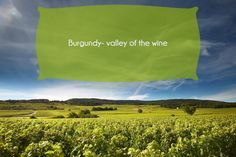 The area where vineyards are located is in the heart of Burgundy; there are surrounded by small villages and hills that provide rain and weather shelter from the strong wind. The best wine of this region originates from the vineyard who are most exposed to the sunshine and drainage. The climate in Burgundy is continental, with hot summer and cold winters, which is pleasing to the Burgundy vineyards. Viticulture in Burgundy originates back in the second century AD. Monks and monasteries had an important role in developing wine making in the medieval ages here, but very little of wine is saved from this period. Many kings and dukes throughout history donated vineyards, and many of them owned one. In the 18th century when the roads through France was built, commerce started to climb, which accelerated the sale of the wine. Late 20th century was a turning point in Burgundy winemaking, and the vineyards set the new course of winemaking, which led to more complex wine. Today these wines are recognized all over the world. 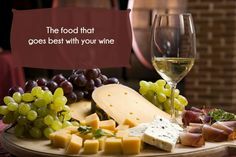 Wine tasting is a fun event that you can do with your friends, family or by yourself. 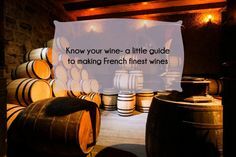 You can visit a wine cellar by your choosing, or book the tour to the most popular wine cellars in the region. There are four steps that you can follow when tasting wine. First is a visual inspection of wine. Second is to smell the wine and identify aromas by smell. Next step is to taste wine, and the last one is to contemplate this whole experience. For many years France was known as one of the world’s largest producer of wine. Traditionally in France viticulturist was a person who grows grapes, and after the harvest forwarded grapes to another manufacture who then processed the wine and sold it. Today thanks to the progress of the technology, every small vineyard can know produce his wine. Many of the grapes varieties are cultivated in France, some of them are internationally known, and some are locally known. Some wines are associated with the certain region in France, like Cabernet Sauvignon which is produced in Bordeaux. But there are some varieties which can be found in two, or three regions, like Sauvignon blanc. A main division of wine is to red and white; white wine is more common than the red. Rosé is a type of wine which has a nice light pink color. It’s produced using the technique for the red wine making, but the taste is more similar to white wine. Many of the French wines are produced using several grape varieties. Information on wine labels depend on which region of France the wine was made in, and also the level of classification the wine carries. The least amount of information the label has is classification, the name of the producer and geographical region where the wine was made. The more quality wines would include on their label the exact village or town, or even the specific vineyard where grapes where harvested. Labels can also include the information where wines were bottled, which can also affect the quality of the wine. Traditionally, France was the largest consumer of its wine. But, consumption of wine is dropping for more than 45 years. For that reason, French wine producers must rely on foreign markets. The statistic shows that wine consumption in France from 2003 to 2015 was 54,8 liters of wine average by the person. But wine consumption decreased to 40. 7 liters per person by 2015. But wine remains favorite alcoholic beverage. With every sort of wine, you can choose food which emphasizes different aromas of the wine. If you choose to have a glass of Pinot noir, it is best to pair it with ingredients like mushrooms, or truffles. Wines like this have savory depth and are light bodied. But if you go for a glass of Chardonnay, the wise decisions is to have fish, for instance like salmon or any seafood. Sparkling wines like Champagne have a light hint of sweetness, and for that reason goes best with salty food. Cabernet Sauvignon is the perfect choice if you have meat for diner, like pork or lamb chops, seasoned with the wide range of freshly herb. This wine can refresh your palate after each bite of meat. This is white wine from the region of Bordeaux. It is aromatic and fresh wine, easily recognized by its harmonic taste. If your dinner consists of salads and dressing, or meals that include sauces, this is the wine for you. This kind of dishes won’t overwhelm vigorous wine like this. It is best to serve it cold. If your snack of choice is cheese, safe way to go is dry Rosé. It has acidity like white wines and the fruity aroma like red wines. Rosé is often used in Mediterranean kitchen. It has a nice pink color, but it tastes like white wine. It’s more popular in the female circles. Malbec is red wine, originated in France. At the beginning of 20th century, it was the most popular variety of grape. It has a wide range of fruity flavors like cheery, blueberry, plum and blackberry. It can have other aromas of coffee, coconut, chocolate, etc. It has a darker color and often is mixed with other wines. You can serve it with duck’s meat, chicken drumsticks, beef, and lamb. It’s combined well with barbecue souses, blue cheese, and mushrooms. The best temperature for serving Malbec is 21 Celsius.